All set to watch the Super Bowl, snack down, and cheer it up with your friends? How about getting in a quick, fat-burning workout first? 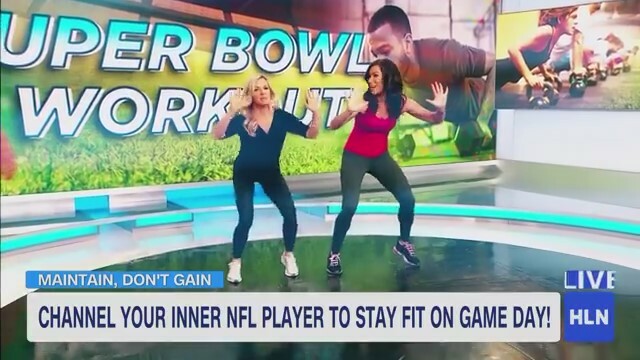 Health and Fitness Expert and Women’s Weight Loss Coach Stephanie Mansour appeared on Headline News to demo a high intensity circuit workout that will have you feeling like an NFL pro on game day! When it comes to getting the most workout bang for your buck, so to speak, you can’t beat high-intensity interval training. I always advise my successful private weight loss clients to sneak in a quick workout before a big party or event. Here are four NFL themed moves to get you in the fat burning zone and breaking a sweat before the big game! Stand with your feet a little wider than hip distance apart. Arms up in front of you, palms facing out. Shuffle in place for about 10 seconds to get that heart rate up! Keep those abs pulled in tight, those feet moving lightly, and your arms up. Now that your body is warm, let’s do a little dynamic stretching before our main exercises. From standing, swing your right leg forward—as if you’re kicking a football—and touch your foot with your left hand. Do this at least five times on the right side before switching to the left leg. Moving on to strength training, we’ve got everybody’s favorite lower-body builder: squats! Squats are such an essential movement for everyone, that’s why I include them in all my weight loss programs for women. Blast your quads and booty by sitting back and pressing through your heels to stand back up. Make sure your knee doesn’t go over your toes, but rather stays in line above them. Drop down and give me five! Push-ups that is. If you need to modify you can always do these on your knees, you’ll still get that arm, chest, and core work in. Some form cues: keep those abs pulled in tight and don’t let your hips sag. Are you ready for how to chain them together for a full-body circuit workout? Warm-up with the NFL shuffle for 10 seconds, followed by five per side Punt & Touches. You can either set a timer for 15 minutes and do as many rounds as possible (AMRAP) or I also recommend shooting for 10 full rounds. That works out to be 50 total squats and 50 push-ups! Enjoy working out like a pro!